AmazonBasics 5-Piece Bed-In-A-Bag - Twin/Twin XL, Navy Plaid Only $38.99! 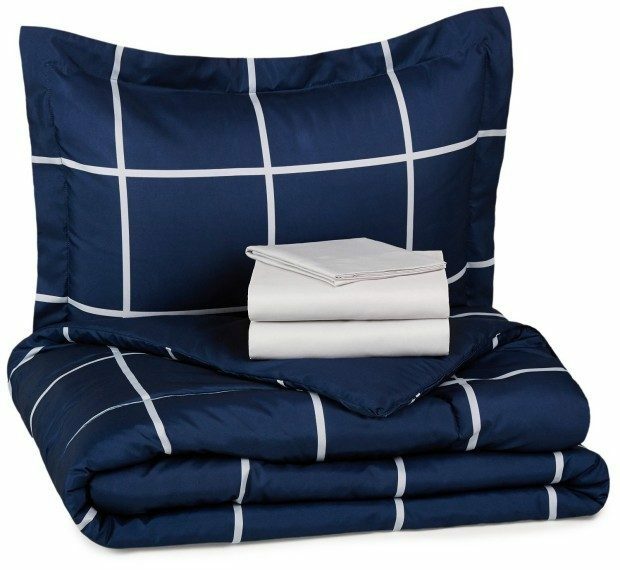 You are here: Home / Great Deals / Amazon Deals / AmazonBasics 5-Piece Bed-In-A-Bag – Twin/Twin XL, Navy Plaid Only $38.99! AmazonBasics 5-Piece Bed-In-A-Bag – Twin/Twin XL, Navy Plaid Only $38.99! This is a great deal because you get everything you need for one price! This 5 piece set includes sheet, pillowcase, pillow sham and comforter. Fabric is made of 100% polyester microfiber for a soft and gentle texture. Get the AmazonBasics 5-Piece Bed-In-A-Bag – Twin/Twin XL, Navy Plaid for Only $38.99! Plus this qualifies for FREE shipping!